Vesper-On gives us another look at their upcoming releases for Carenvale with The Butler. Don't call him Alfred. 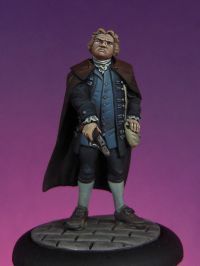 The second miniature for this relase: the Butler, from the Patricians Faction. Most of the decadent nobles wouldn't be able to tie their shoes without the help of their personal servants. There's no doubt in that going out into the streets to assault the poor can be that kind of business that might require the help of the faithful Butler.